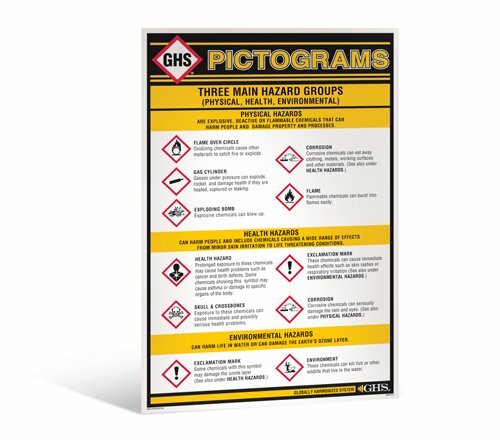 Our HazCom GHS Pictogram Wall Chart is a quick and easy way to convey the new HazCom GHS pictograms in the workplace. Printed in full color on sturdy semi-rigid plastic, this wall chart clearly displays the new pictograms for Physical, Health & Environmental Hazards required by the HazCom GHS system. The wall chart also provides a detailed description of the related hazards. Easily mountable on any wall. May be used for both indoor and outdoor applications. Units are 24″ x 36″. If you have any questions about this product by Incom Manufacturing, contact us by completing and submitting the form below. If you are looking for a specif part number, please include it with your message.